Welcome to this Guide for ENGL 1101! The information in this guides supports research assignments in English 1101 classes, but you may find it useful for other classes as well. Follow the guide in sequence for a complete tutorial, or skip around to the areas that interest you most. Evaluating Sources - How do you know what's a good source? 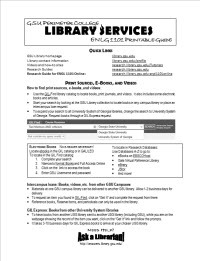 Use this catalog to find physical items at GSU and USG Libraries, e-books, and some streaming videos. Whether you take classes Online only, Face-to-face, or both, GSU Library is here to provide you with the resources you need for your research assignments as well as librarians to help you. Get personalized help from librarians or learn on your own online. Ask a librarian for help in real time via chat or phone. Email us after hours to get an answer when the library opens. I've suggested video tutorials and step-by-step web tutorials at appropriate places in this guide. For more tutorials, follow this link. Our list of Frequently Asked Questions is available 24/7. You may browse the answers, search by category, or type your question into the search box. If there is no satisfactory answer, you can e-mail a librarian and we'll answer you within one business day. This guide is about English Composition, but we have lots of other guides about English and many other topics. A series of videos with tips for researching literature topics and demonstrations of several databases. Be sure you use the GSU Library site instead of GPC. This box is the same one that appears on the library home page. Chat service is staffed by reference librarians at Perimeter and Atlanta. When chat isn't staffed, it becomes a LibAnswers search box and users can submit their own questions, which goes to a helpdesk-like queue. Watch one or watch them all!